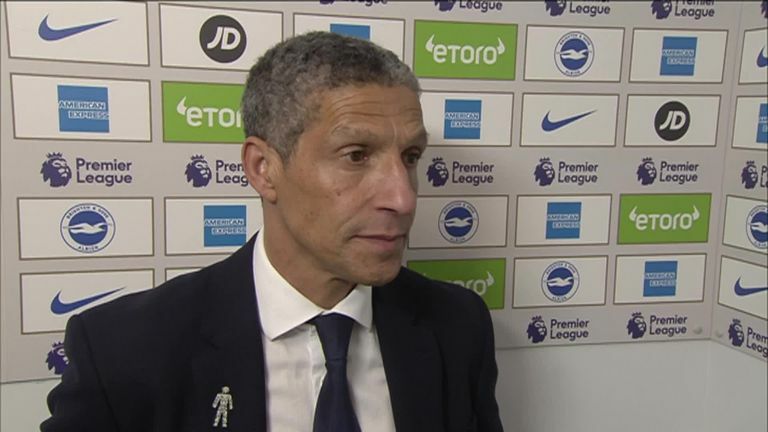 "It's about making sure we're in this division come next season, we need to do everything we can to make sure that happens"
Chris Hughton says Brighton must do "everything we can" to avoid Premier League relegation after their 2-0 defeat to Cardiff at the Amex. Brighton's disappointing loss at home was their fourth Premier League defeat in a row. It means the south coast club are now just two points above 18th-placed Cardiff on 33 points with five league games of their season left. Brighton have a game in hand over Cardiff, away at Tottenham on April 23. Hughton believes his side have what it takes to stay up this season and that their fight to stay in the Premier League is in their control. "It's still in our own hands and this is how we have to look at it," he told Sky Sports. "This is a huge disappointment for us this season, particularly at home, but we have to find a way around this and there isn't anybody in this changing room who hasn't had a similar fight on our hands. "We need to make sure we show the quality, fighting spirit and togetherness that we can and take it into our final games. "It's about making sure we're in this division come next season, we need to do everything we can to make sure that happens." Brighton have now lost three consecutive league games at home. For Hughton, he says his team were naive in conceding the second goal; Sean Morrison's 50th-minute header. He added: "It was a tough night and probably a reflection of where we are at the moment. We pushed but unless we're managing to get goals we're generally on the back foot. "You become susceptible to the quality they showed on the first goal and the naivety from us with the set-play but that's a feel of where we are at the moment."